SWALCO America Recycles Day ... Intro to New Recycling Guidelines! Celebrate America Recycles Day & Recycling Right in Lake County, Illinois! Today, November 15, 2018, Americans all around the country will be celebrating America Recycles Day and you can too! 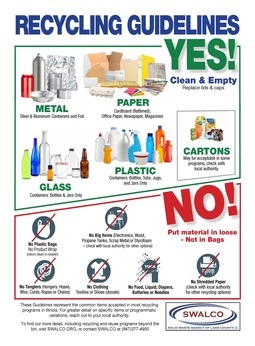 This special day is set aside to recognize the importance of recycling and at this time, SWALCO would like to introduce the latest guidelines for “Recycling Right” in our Lake County community. Please take a look and learn if you are “recycling right”. Find a place to keep these handy…we hope maybe they’ll adorn the front of your fridge. Share them with neighbors, family and friends who are residents of Lake County. You’ll see we’ve moved to a simpler format: clear YES and NO sections with visual lists of accepted and not accepted items and guidelines for processing. Please take a special look at the NO list, as these contaminants can negatively impact recycling efforts in so many different ways. It’s estimated that as many as one in four items placed in a recycling cart, is not accepted for recycling. These new guidelines will be used by communities throughout the State, although they may vary slightly from community to community. It’s a great time to review, reconnect and make sure you’re getting all of the right things in, and keeping the wrong things out. Through swalco.org you’ll see that we do have some alternative recycling and reuse opportunities for some of those NO items. Take advantage of local programs or opportunities near you. There are so many reasons to recycle more. Recycling matters because the more we recycle, the more we save. Our resources last longer and go farther with future generations in mind. When we recycle, we’re not extracting precious and fresh materials from the Earth whenever we want to make something. Through recycling, we have an abundant supply of resources for this at hand. Recycling preserves landfill space and reduces the need for landfills. By recycling, we save energy, prevent water, land and air pollution, reduce carbon emissions, protect wildlife and wildlife habitat, as well as create jobs and help the economy. Think you can’t make a difference? You can!!! Each and every one of us can. A family of four can minimize waste by more than two tons each year just by the easy task of recycling. Every time you walk to your cart, or pass by a recycling container, think about all the many reasons we do recycle and why we even have a day to celebrate this noble and important endeavor. Be sure to visit Swalco.org, sign up for our newsletter and follow us on Facebook and Twitter for future details and information on recycling. If you’d like to learn more about America Recycles Day, visit americarecyclesday.org. Take the pledge as others have to reduce waste, buy products made with recycled content, and recycle right/recycle more! Make a difference in your local community and our beautiful Planet Earth beyond. Happy America Recycles Day to you from the Team at SWALCO!